J.R. Mattison started her career in Chicago appearing on television and radio. She founded Cheshire Smile Productions, bringing to life and penning her first feature film Fish Without a Bicycle, a festival winning coming of age comedy, which was directed by Brian Austin Green. Fish is now available on Netflix and garnered a limited theatrical release. Mattison also wrote Cheshire’s second release The Third Wish, now available at Neflix and distributed by the Hallmark Channel. Lionsgate’s For the Love of Money, based on a true story of Jewish gangsters set in the 1970’s, starring James Caan, Paul Sorvino, Edward Furlong, and Jeffrey Tambor was also produced and written by Mattison and released theatrically in the US & Israel. Most recently Jenna wrote Commited, for Mar Vista Entertainment, a TV movie which wrapped production this spring to premiere on television this fall. She is currently in development of her original paranormal series Devil’s Highway alongside producer Michelle Weisler (The Ring, The Trouble with the Curve) and is set to make her directorial debut on The Buddha’s Wife starring Sadie Frost and Oscar nominated Maria Grazie Cuccinotta, based on a novel of the same name. 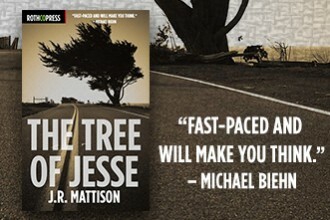 Her debut novel The Tree Of Jesse, a paranormal romantic thriller, was released this year to critical acclaim and is available worldwide. Mattison’s most recent novel Eye Spy, the first in a comedic romantic suspense series, was released in July and hit bestseller status within the first week. Book two of the series, Dog Eat Dog, will be released this fall.